"The attached pic is of my best friend and I at finals. 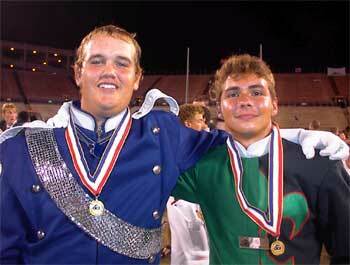 He (Rodney Thompson) marched Scouts, and I (Alan Macon) went with the Bluecoats. We both had awesome summers and somehow managed to get a pic at the end of it all." Thanks Alan! E-mail your Forzato submissions -- and we will get to them all, in time -- to dave@dci.org along with where and when the photo was taken. Send some biographical information about yourself as well. We'll give you full credit. Also, let us know if you want your e-mail address included, to get feedback from other drum corps fans.